My daughter, Amy, recently found these almost 43-year-old snapshots in an old photo album, and sent them to me. 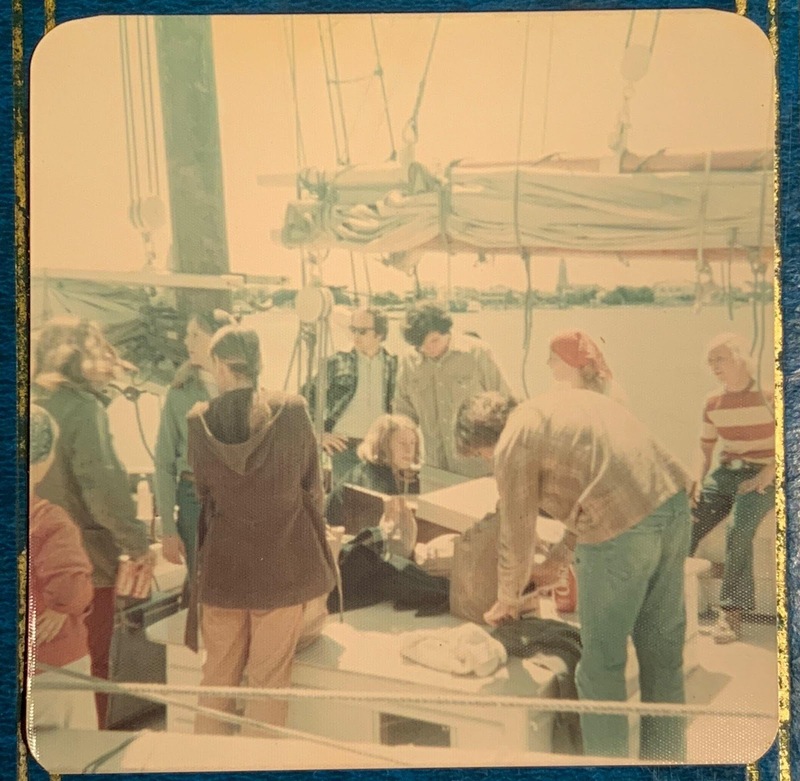 They were taken in April of 1976 aboard the 73-foot, two-masted clipper schooner, Mary E. Most of the people in the top picture are Ocracoke High School students. That is me, Philip Howard, in the bottom photo. 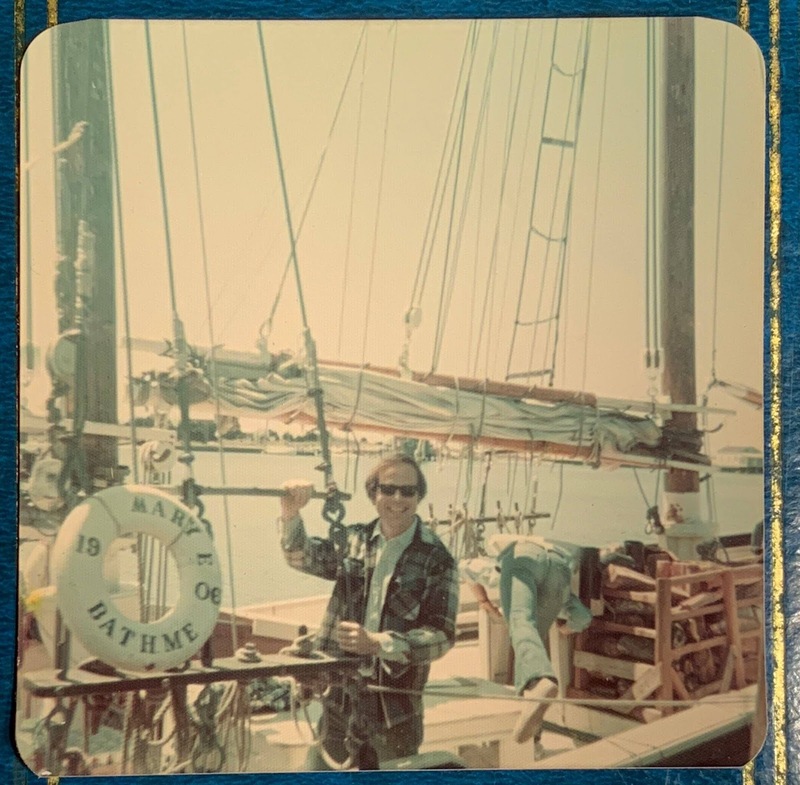 As part of the 1976 Bicentennial Sail jointly sponsored by the National Park Service and "Sea Ventures," a New Jersey-based educational organization, the Mary E (she was built in 1906) was being used as learning motivation for students in schools near various East Coast Parks. In April of that year, bound for Manteo, the Mary E made a stop at Ocracoke and was detained by bad weather for several days. While on Ocracoke Meryl Silverstein, the onboard educator, first mate, cook and deckhand, made arrangements for Ocracoke students to inspect the ship. But instead of giving them the usual 20-minute program, Capt. Teddy Charles invited them to sail to Manteo, 70 miles north. Within two hours, 13 Ocracoke high school students, three adult supervisors, Silverstein and the skipper were sailing out of the harbor with excited parents, friends and teachers waving. You can read the history (and current location) of the Mary E here: https://www.mainemaritimemuseum.org/visit/1906-schooner-mary-e/the-history-of-mary-e/. And you can read about the skipper, Capt. Teddy Charles, sailor and influential jazz musician, here: https://en.wikipedia.org/wiki/Teddy_Charles. Maybe some of our local readers can identify the students in the top photo (I can only recognize a few!). Please leave a comment if you can. Remember, to be notified when we publish a new post simply add your email address in the box at the top right and click "submit." Capt. Rob Temple offers sailboat charters on the schooner Windfall (http://www.schoonerwindfall.com/), but for only up to six people. I don't know of any other sailboat cruises at Ocracoke. Fun pictures! Those were the days. What a great memory. Phillip.... 1976 and no Fro? I'm dissapointed. Who owns the wind fall. Didn't someone give it to Ocracoke a couple of years ago?? Anyway, it's a nice sail boat. Thanks for the info. The schooner Windfall is owned and captained by Rob Temple. You are probably thinking of the skipjack Wilma Lee which was donated to one of our local non-profits, Ocracoke Alive, a few years ago. Because of several changes of circumstances and after much consideration, the Wilma Lee was sold to the Annapolis Maritime Museum in the Chesapeake Bay, thus returning the Wilma Lee to where she was built and where she worked as an oyster dredger for many years. The tour like https://www.imanali.in/manali-tour-package-ludhiana is one of the most enjoyable thing in this world. This will give you the chance to see the whole world with your own point of view. This will make you feel that you are in the world of joy and happiness. This will give you the best experiences of your life.